LET BLUE ADOBE MORTGAGE SHOW YOU HOW EASY IT IS TO BECOME A HOMEOWNER. We specialize in residential home loans and are proud to service the Central Coast and surrounding counties. Our strategy is to deliver to you the power of a national mortgage lender but with personal attention of a local lender. We look forward to offering the best customer service in the industry! Our team of highly trained mortgage professionals are licensed to offer individual solutions to your unique financial circumstances. The internet is great, but we feel that you need personal boutique service when shopping for a mortgage. 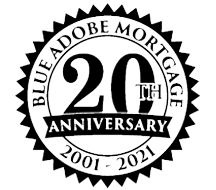 What can Blue Adobe Mortgage do for you? In today's home-lending market, mortgage lenders can serve as safeguards, offering their clients security, safety and peace of mind. One of Blue Adobe Mortgage's most important functions is escorting your loan application through the entire process, constantly patrolling the component transactions for possible breakdowns. We can wade through the mountains of rate data and program options, researching current market conditions to find the most accurate and up-to-date information about cost-effective loan options. There are literally thousands of variables that can affect the outcome of your mortgage transaction. That's why you need Blue Adobe Mortgage to act as a liaison between the Title and Escrow Company, Real Estate agent, lender, appraiser, credit agency, the underwriters the processors, attorneys, and any other services which may affect your transaction. At Blue Adobe Mortgage communication is the key to your home loan. Blue Adobe Mortgage is a Division of Summit Funding, Inc. This puts us in the unique position as a lender on the Central Coast of CA. We have the strength of a national mortgage lender and also the flexibility to meet the local communities lending needs. Blue Adobe Mortgage was founded in 2002 and in 2011 we became a Division of Summit Funding Inc. Since our doors opened in 2002, we have been bringing some of the best loan programs to market for our unique Central Coast communities that we serve. We remain one of the top 5 lenders on the Central Coast in closed purchase loan volume. Blue Adobe Mortgage is Relationships and Solution-Oriented lending. 99% of our business comes from referrals of past borrowers, Realtors and other professionals in our industry. We have helped approximately 7000 people obtain homeownership over the last 16 years. We support the local Association of Realtor offices in Monterey, Salinas, Watsonville, Santa Cruz and San Benito County. Each of our loan officers and staff, help support our local communities by volunteering their time and knowledge in support of many worthwhile charities and local leadership activities.